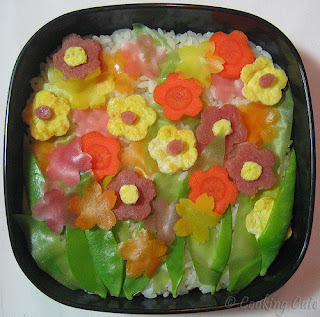 More Than Just Corn: Day 13 - Bento anyone? 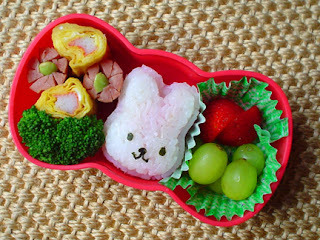 Have you joined the Bento craze? Obento is what the Japanese call a packed meal, usually lunch. Bento boxes have internal cubbies, containers and dividers, so that different kinds of foods can sit in their own little pretty spaces. There are neat lunchboxes to use (or you can improvise). Black seaweed sheets are used to decorate with faces using punches or premade cutouts. There are special cookie cutters, shapers, presses, picks and other accessories that contribute to this madness. 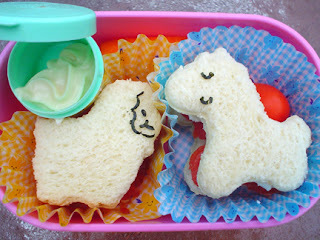 In other words, cute lunches! It makes sense really, those smart Japanese folks who have done this for years, to present your food in an appealing way for the senses. We are visual people, and something seems to happen to a child (and grown ups too!) 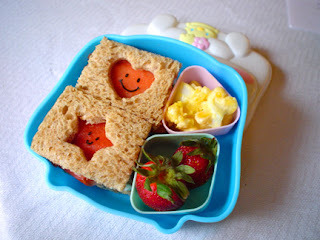 when their lunch is all cute and neat and sectioned. My friend Haley mentioned this latest fad that was sweeping through her school. My first thought was that there was no way I was going to spend time pressing sandwiches into teddy bear face molds, or making hotdogs look like octopus characters. It would take forever to make cute little vegetable flower discs right? Or create a picture on his plate with the foods I’m serving right? Then I researched (because I have my fancy degree from The School of Google) this whole maddening craze. Guess what, I began to change my thought process a bit. And it really doesn’t take long to prepare your items – and some can be done in advance to use for the next few days. So now I have a few friends that have jumped into this Bento Box thingamabob with such gusto and have found the changes in their kids’ eating habits to be revolutionary! Kids. Are. Eating. 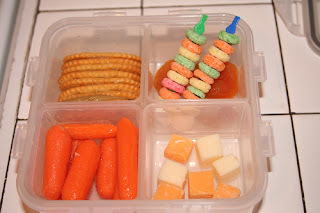 I personally, have only done a Bento style meal for Carter a handful of times. I want to embrace this, and am trying to do it, but my kid is making this difficult on me! Funny thing about children with Autism (and probably some without), is they like things “just so”. And “just so” to Carter means to have his lunch consist of the same things, every single day. Not only the content, but the shape and size. He prefers the 4-way triangular cut method on a peanut-butter only, white bread (but I can sneak in the whole grain white) sandwich. He wants 6 pretzels and 6 grapes – because he’s 6 years old. His juice box has to be in his lunchbox on the left. Bah! I have to resort to hiding such foods and pretending we’re out of them, so that I can send along something different in place of pretzels and grapes. Sometimes the sandwich can be substituted with peanut-butter crackers (thanks, Nana) because eating peanut butter crackers is in the genes. Recently, he marched off the bus, into the house – and before I could ask him “how was your day?”, he began his diatribe (hands on hips and crunched up angry face in full swing staring me down) about how he never, ever, ever, NEVER wants to have Snowman shaped peanut-butter sandwiches again! After I regained my composure of shock, then laughter, I attempted to convince him that it was hip and cool, and fun that he got a surprise in his lunchbox! He demanded to know what happened to the plastic Ziploc baggies I used to use to put his goldfish and grapes into. He wanted to know why they were in “gray cups” (I used cute tinfoil muffin wrappers) and why I wrote on his napkin! Oh my….. I was in trouble. It’s going to be a little difficult to try the Bento shtick on Carter it’s looking like. I thought it might help him to discover how to be a little less rigid about things in life. I will keep trying, but in the meantime I will have to live vicariously through my friends who are having more success. 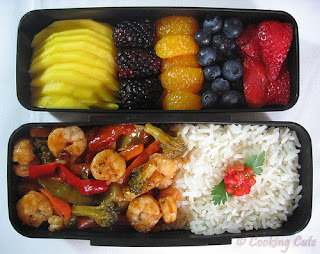 There are thousands of pictures of Bento ideas on the ‘net, but I’m going to include just a few pictures of very basic and simple Bento Lunch ideas I’ve found. Maybe you might want to try this out yourselves – either for your kiddos, or for your own dining pleasure! You can click on each picture for a larger, more detailed look! I know where you can get some really cool Corvette shaped cookie cutters. I'm sure they would look better than some snowman. What a riot! I could not stop laughing. Tears down my face laughing! He is something. I can picture the whole scene. LOL! I first heard of this from Melissa's site. It looks quite fun. Although rigid, yes rigid is nice, good old comfortable predictable rigid. Oh sorry. . . had a moment there.